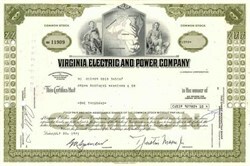 Beautifully engraved certificate from the Virginia Electric and Power Company issued in 1971. This historic document was printed by the American Banknote Company and has an ornate border around it with a vignette of a map of Virginia between two allegorical men. This item has the printed signatures of the Company�s President and Secretary and is over 31 years old. Two of the founders of Dominion Resources' predecessor were George Washington and James Madison. In 1781 the Virginia General Assembly established the Appomattox Trustees to promote navigation on the Appomattox River. In 1795, the trustees (including Washington and Madison) formed the Upper Appomattox Company canal operation to secure water rights to the river. The company took over several hydroelectric plants on the river and added a steam power facility in 1888. Frank Jay Gould bought a successor company in 1909 through his Virginia Railway and Power Company (VR&P). The firm purchased several electric streetcar lines and electric and gas utilities the following year. VR&P was acquired by New York engineering firm Stone & Webster in 1925. Stone and Webster placed it under a new holding company, Engineers Public Service (EPS). VR&P's name was changed to Virginia Electric and Power Company (VEPCO), and the firm bought several utilities in North Carolina. During the 1930s the automobile and the Depression put the company's trolley lines out of business. In 1940 the government sued EPS under the Public Utility Holding Company Act of 1935. This in effect triggered an era of regulated utility monopolies. EPS was forced to divest itself of everything but VEPCO. 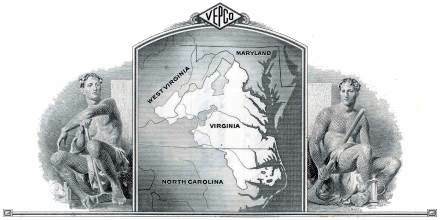 However, VEPCO soon doubled its service territory by merging with the Virginia Public Service Company. The number of electric customers increased by about half from 1950 to 1957, so the company added new plants to keep up with demand. It also built the world's first extra-high-voltage transmission system. VEPCO's first nuclear plants went into service in the 1970s. In 1980, company President William Berry became an early proponent of electric competition. The company redefined its corporate identity and image, and began using the names Virginia Power and North Carolina Power. Then in 1983 Berry formed Dominion Resources with Virginia Power as a subsidiary, then halted nearly all plant construction to emphasize transmission. Two years later Dominion Capital was formed; Dominion Energy followed in 1987. Thos. E. Capps took over as CEO in 1990, and Dominion sold its natural gas distribution operations. Dominion Energy formed joint ventures to develop natural gas reserves. The firm bought three natural gas companies in 1995, and the next year Dominion joined with Chesapeake Paper Products to build a cogeneration plant. Dominion acquired UK power firm East Midlands Electricity in 1997 and sold it to PowerGen 18 months later. Also in 1998, Dominion bought an Illinois power station from Unicom's Commonwealth Edison. The following year Dominion reorganized in preparation for energy deregulation by separating its generation activities from its transmission, distribution, and retail operations. In 2000 Dominion bought Consolidated Natural Gas in a deal that transformed Dominion into one of the largest electric and gas utilities in the United States with more than 4 million customers. It agreed to sell Virginia Natural Gas (acquired in the Consolidated Natural Gas deal) to AGL Resources. The company also agreed to pay $1.3 billion for Northeast Utilities' Millstone nuclear power complex, which includes two operating reactors and one that has been mothballed and is being decommissioned.